Pilgrimage [pil-gruh-mij] Def. a journey, esp. a long one, made to some sacred place as in an act of religious devotion. It is curious to apply a term like “pilgrimage,” with religious connotations, to something involving science, but my “science pilgrimage” to visit the twin Keck telescopes was nothing short of sacred. In fact, standing in front of the august Keck I and II I felt a certain level of catharsis, a cleansing, an overwhelming calm. All was right in the universe at that moment. Sound familiar? Read on. My trip to visit the Keck telescopes on top of the dormant Mauna Kea volcano on the Big Island of Hawaii started with my longstanding desire to see the Keck scopes first hand, so when the opportunity presented itself, I was on board in a big way. My anticipation for scientific nirvana was stellar leading up to my trip a few years ago. I planned the trip quite methodically and I’ll recount it here for the benefit of all you Science Lifestylers so you may follow my path. My sojourn began with my girlfriend and science companion extraordinaire Zoe, as we planned our flights. Fortunately, there are many direct flights out of Los Angeles International Airport (LAX) to the Big Island’s Kona-Kohala coast. You definitely want to fly into Kona International Airport (KOA) on the western side of the island as opposed to Hilo on the east. There is a wide variety of accommodations in Kona during your stay. Huge, sprawling resorts are de rigeur. Our choice was the Four Seasons Hualalai, which is only 10 minutes from the airport and has a superb location with absolutely excellent guest services and facilities. Next, we managed to locate a well respected tour operator that routinely carries visitors up to Mauna Kea. The company is called Mauna Kea Summit Adventures: www.maunakea.com. The pick-up point Zoe and I used was at the Queens Marketplace Waikoloa, a short cab ride from the hotel. The trip up to the summit was long and filled with anticipation as we rolled along the Big Island countryside. With a pickup time around 4pm and final drop off just after 11pm, the adventure makes for quite a few hours of excitement. The tour company operates comfortable vans (having a capacity of 13 people) with very informative tour guides to point out highlights of the beautiful scenery along the way. The first destination is the Mauna Kea Visitors Center which is at an elevation of about 9,000 ft. It is there you are provided a nice meal prior to the ascent to the summit. But Zoe is a delightful chowhound and I regularly benefit from her culinary prowess, so she arranged to tote along our own special dinner prepared by our hotel. After dinner, it was time to suit up for the weather conditions up at the summit; a chilly 35 degrees (imagine that, in an island paradise no less). We were given arctic style hooded parkas and gloves, and the group piled up in the van for the final half hour drive up to the summit. As the van crept up the unpaved road, we were told about the locals using the mountain for skiing. The tour schedule is designed to arrive at the summit just before sunset. The view from Mauna Kea is unbelievable. I noticed what looked like a small “rock” in the ocean. I was told that the rock was in fact the island of Maui! Our brief stay on the summit, less than an hour, provided enough time to explore the pinnacle of astronomical discovery – an international collection of telescope facilities. Because of my excitement, I wanted to dash about to see everything I could, but I quickly realized that the 14,000 ft. elevation was not conducive to fast activity. Trying to catch my breath, I slowed down to a more seasoned pace to take in all the sights. We took some great photos of all the sights. 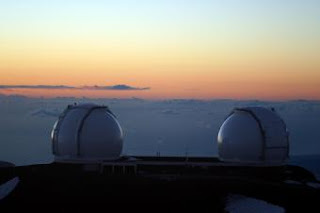 All told, there are 13 telescopes spread across the Mauna Kea summit, supported by a number of countries and research institutions. Visitors can’t actually go into any of the telescope buildings, but with luck one of the dome’s doors will open up and you can see a giant telescope slew into position. Most of the science is not done at the scopes like days gone by with the astronomers peering through eyepieces. Rather, scientists control the telescopes remotely and access the observational results in the form of immense digital data streams. The time spent on the summit seemed all too brief, but what with the temperature, wind, and elevation, it was probably for the best to start our descent. For some reason Zoe wasn’t affected much by any of this, but she’s always been more of a hearty experimentalist in contrast to my being a theorist who is more comfortable next to a cozy fireplace to ponder the cosmos. On the way back down, we stopped back at the Visitors Center for a snack, souvenirs, and stargazing with a nice sized 11” Celestron telescope provided for our viewing pleasure. On the long drive back to the pickup point, Zoe and I found much time for reflection on the spectacular events of the day. The pilgrimage to visit the Keck telescopes was an excellent choice for a vacation in paradise. There’s really nothing like a science vacation.